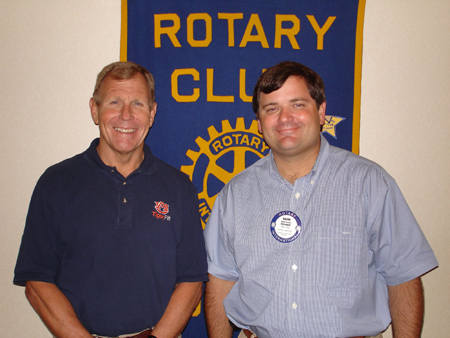 Jim McDonald spoke to the Auburn Rotary Club about Auburn University’s TigerFit program, a service of the Department of Kinesiology in the Auburn University College of Education. The program offers any adult a fitness assessment and health profile through a student service-learning environment. These assessments are conducted through scheduled appointments for a small fee. To inquire about our schedule an assessment, contact McDonald at 334.844.1482 or go online to https://education.auburn.edu/centersandinstitutes/clinicandlaboratories/tigerfit.html. Pictured with McDonald is Club President David Reaves.